It’s hard not to smile when I think about these pancakes. They smell heavenly and they taste perfect! I am in love with them! Preheat pancake griddle to 350 F.
Combine pancake mix, yogurt, orange juice and water. Mix together until there are no lumps. If the mixture is thicker or runnier than you prefer, adjust the orange juice or pancake mix accordingly. Evenly pour the mixture onto the griddle to create 4 pancakes. Let cook until the top is bubbly and the bottom is golden brown (3-5 minutes) and then flip. Cook for another 3-5 minutes. Meanwhile, combine orange juice, sugar, vanilla and cornstarch in a sauce pan. Heat over high, stirring frequently, until the sugars are dissolved and the mixture comes to a boil. Remove from heat. 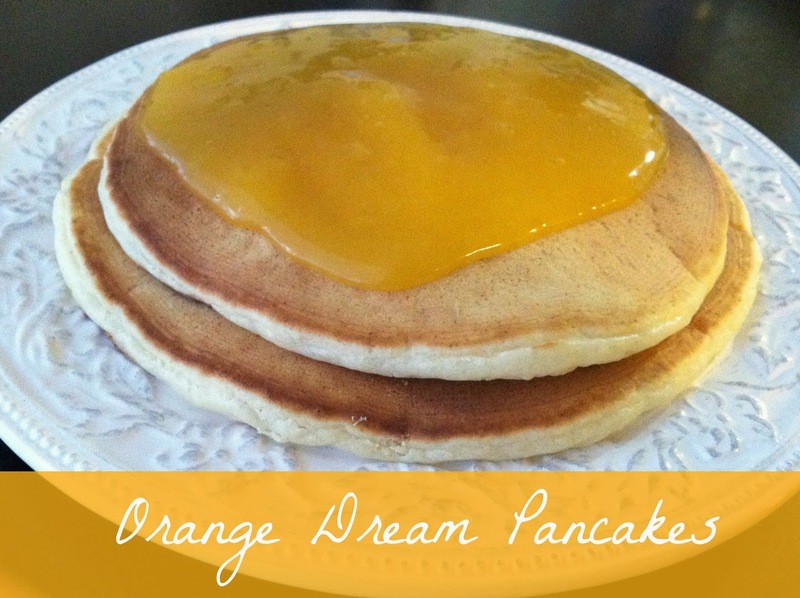 Pour the orange sauce over the cooked pancakes and top with your desired toppings.